Home DIY's	Floral pins ~ the perfect compliment for your wedding flowers! Pin flower heads to a Styrofoam shape to create a fresh flower ring bearer pillow! Use colored pins and floral adhesive to add a creative touch to purses or gift bags. Shorten pins with wire cutters, and then use hot glue to make clusters of pins for an extra added touch of color to corsages or boutonnieres. Use contrasting colors of pins in a flowers bloom to bring out the colors of other flowers in the bouquet. Use pins and ribbon or floral tape to wrap the stems in a bouquet. 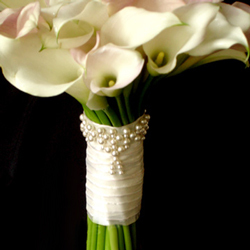 Use a pearl colored pin to make the center in a smaller flower, like a stephanotis. Use several pins in the open bloom on a rose. Gerbera daisies are great for a tri-pin accent. Wrap wide leaves around a Styrofoam frame and use pins to secure. Beautiful for menus, pictures or announcements on display. Use pins to wrap ribbons or other accessories into wax candles, just don’t light them! Pins are available at www.Fiftyflowers.com!